Day 1	Bus to Chainpur Via Dhangadhi, about 20 hour. Day 2	Trek to Suligad via Lamikhel and camp. Day 3	Trek to Suligad river. Day 4	Lekham (camp) other side of the river. Day 5	3 hrs. trek to Deura and raft towards Dhunaggad and camp on the way. Day 6	Raft & camp nearby Gopghat. Day 7	Raft & camp after dipayal (after big rapid). Day 8	Raft and camp just after Gandigad confluence on the left side. Day 10	Raft & camp before Karnali confluence near water measure station. Day 11	Raft and camp on yhe way. Day 12	Rafting ends at Chisapani and drive towards Bardia National Park or Kathmandu or Pokhara. 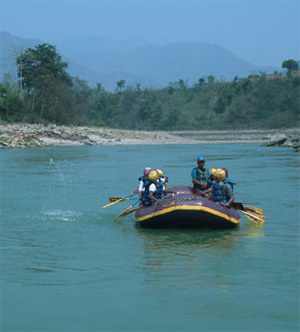 Click to see the details of each river rafting we have for Rafting in Nepal. Copyright © Holiday Adventure Nepal 2018. All Rights Reserved.